A Tale of Two Apple Trees. 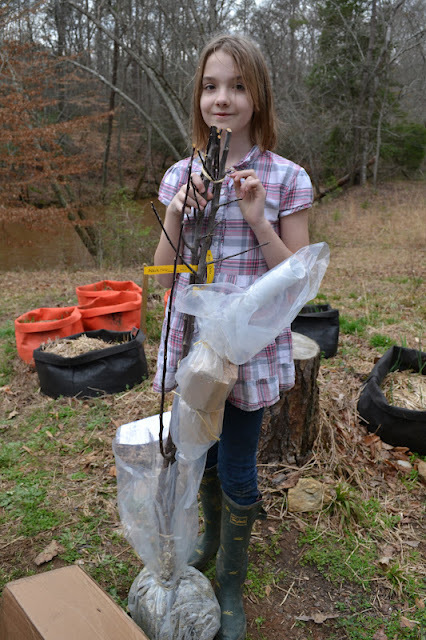 Saturday, we planted trees. Apple trees. 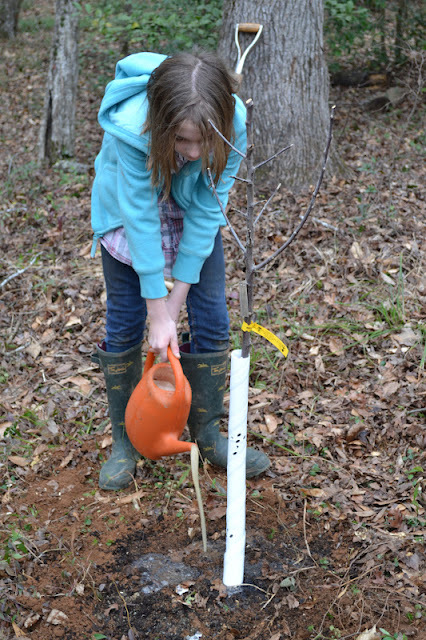 To be more precise and risk sounding pretentious, we planted organic, heirloom apple trees. Still, the dream of apples growing in our backyard seemed unrealistic.
. During one of these segments, a caller asked about starting an apple orchard in our region. The hosts informed him that apples don't grow well in South Carolina, and he should pursue other ideas. 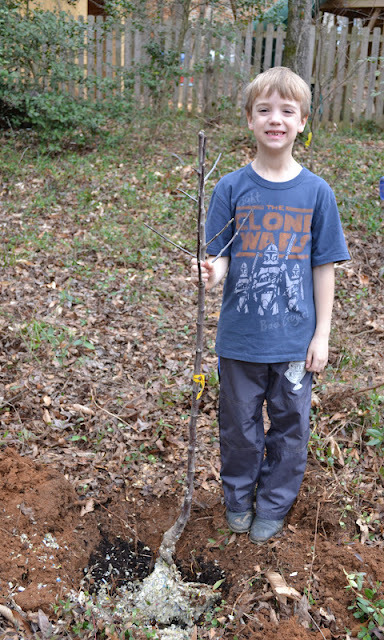 Our apple tree idea was—pardon the really bad pun—chopped down. People were lined up, waiting for their turn to purchase this comprehensive tome of the pomme. As I tagged plants and made change for customers, I told Mr. Calhoun of our apple plight and asked if he could recommend a variety that might do well in our garden. Mr. Calhoun devotes his life to pomology. I figured, if anyone knew an apple tree that could grow in our backyard—he was the man.
. I adore this company's website. 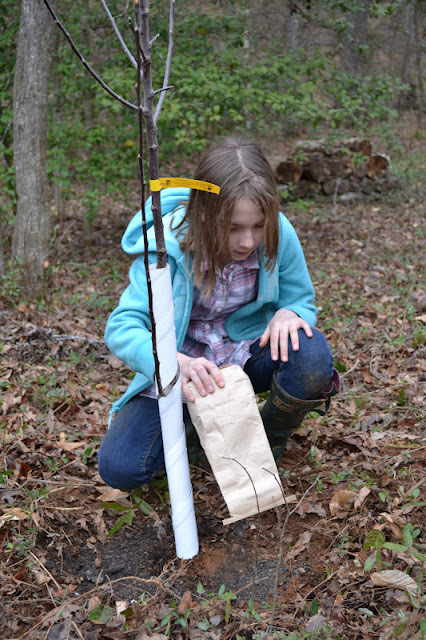 I felt like a kid in a candy shop—and could have spend a small fortune on fruit trees. But I resisted. Sadly, our UPS guy didn't share the same reverence as I did for our apple trees. There's something—sacrilegious--about leaving Trees of Antiquity apples trees standing on their theoretical heads. Fortunately, the company anticipated such treatment—the trees were well packed and unscathed by their upside down delivery. The kids wanted to plant the trees immediately, but Peter needed to clear some space in the garden. Also impressive was the detailed instructions included with the shipment. Along with the trees, I decided to order a “starter kit” for each tree that included a tree guard, branch spreader, label, organic amendment, and humates. What can I say? After waiting this long for apple trees, I wanted to ensure the best start possible for them. Choosing the variety you wish to grow is a personal preference, but it can also be based on climate, like with our selection. Do you prefer tart or sweet? Will you be eating fresh or cooking with the apples? And—does your tree need a buddy so it can be pollinated and produce fruit? “The ultimate in a tart apple. Fruit is medium to large with varying color, usually green to yellow skin that is streaked and flushed red. The yellow flesh is firm and fine grained with tannic juice that adds a kick to sweet or hard cider. Great for eating fresh or cooking, this apple is an excellent keeper and should be stored in the refrigerator for peak flavor. 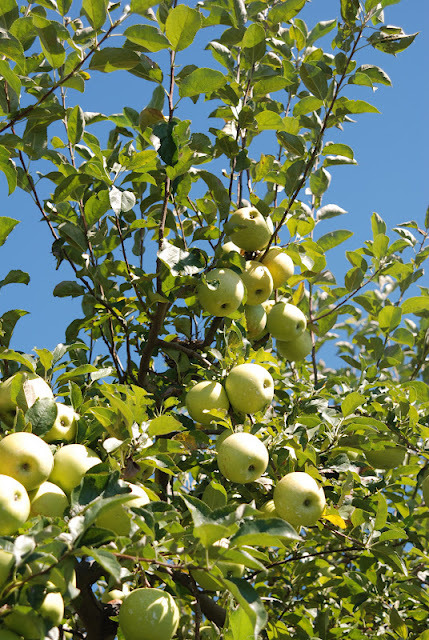 If you hesitate to plant an apple tree due to space restrictions, you can find dwarf and semi-dwarf trees or train your tree into an espalier by pruning. You can also plant trees in containers, but you'll need to pay close attention to watering, as containers dry out quickly. Every two to three years, you will also need to replant the tree into a larger container with fresh soil and trim back some of the larger roots to ensure its health. 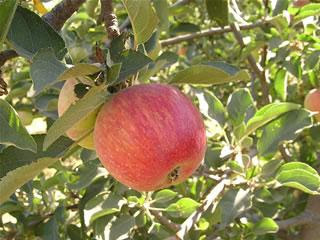 Our apple variety is grafted onto semi-dwarf root stock, which means the trees will reach an average height of 15 feet. The root stock helps control issues with pests and diseases. Dwarf root stocks typically grow 6-9 feet, which is ideal for containers or small areas. After looking at different varieties, we took a family vote. Our green apple lover—who was outvoted—agreed that Blacktwig looked pretty delicious! Fruit trees require a minimum of 6 hours of sun daily. According to Trees of Antiquity, though, partial shade during the warmest hours of the day can improve the texture of apples, particularly in extremely hot climates like ours. Our apple trees are surrounded by a forest, so Peter first prepped the site by cutting out dead trees and branches to ensure the apple trees would have adequate sun. 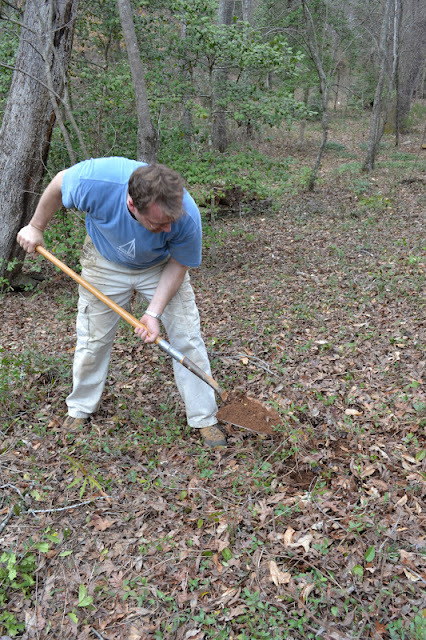 We also battled some native vines that were overrunning the forest floor and cleared them out prior to digging the holes. Peter dug holes slightly larger than the root system of the trees, and I added some finished compost into each hole. Don't add chemicals or fresh manure into the hole, as they can burn the tree roots. 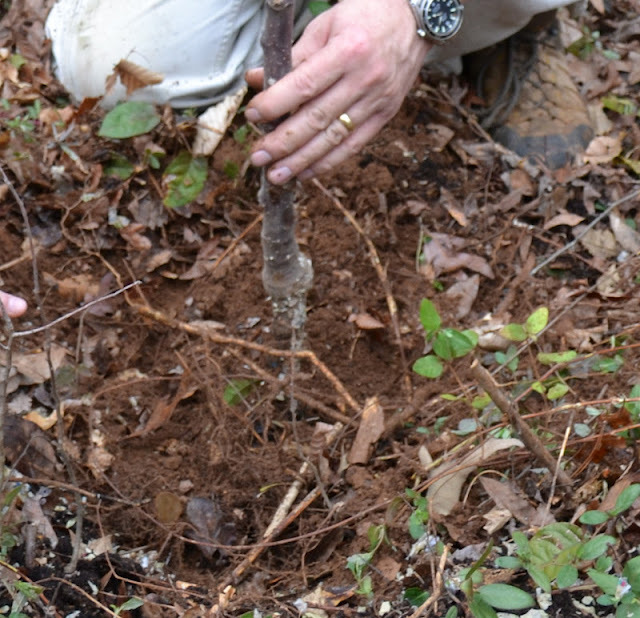 We positioned the trees so that the graft line was about two inches above the soil surface, then filled the holes with the native soil, tamping down to avoid any air pockets. 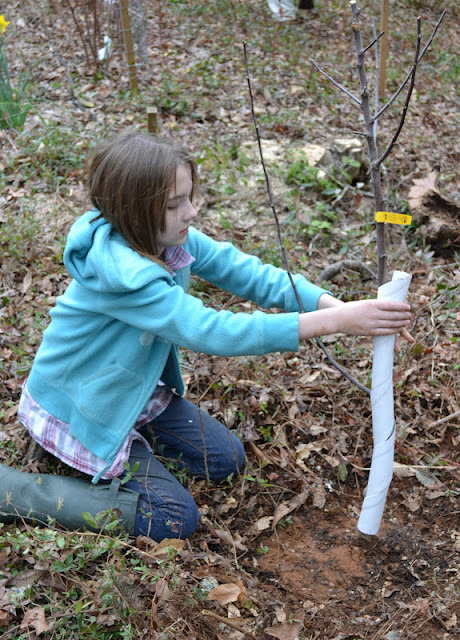 Because our trees are planted in the forest, we added tree guards to the trunks. The guards protect the trees from gnawing rodents, deer, and rabbits, plus it also prevents sun-scald. The spiral guard is perforated to prevent heat build up, and according to the directions, should be removed and reinstalled annually to prevent girdling. The installation of the guard was easy—starting at the base, wrap upward to the first branch with the overlap of the spiral pointing upwards. Two minutes of time to install the guards, and they will hopefully keep our babies safe. In other words, good stuff! In addition to the organic amendments, we also received a bottle of humates, which are comprised of humic and fulvic acids. These activate the availability of soil nutrients, mobilizing them for uptake by trees and plants. And finally, we added a layer of leaf mulch to the planting site. Once the trees leaf out, they will require regular watering, at least twice a week throughout the first season. Always check the soil before watering, particularly with containers—which will most likely require daily watering. And—that's it. Now, we wait. Sunday morning, our girlie went out to the forest in her PJs to check on “her” tree. The trees were still there, she reported. They hadn't walked away overnight. And they seemed "happy." Now, I need to convince her to share "her" apples with us this fall!